Problems in this worksheet require the use of area, perimeter, and circumference formulas for squares, rectangles, and circles. 1) Find the side of a square if its area is 81 cm2. 3) Find the area of a square if its perimeter is 80 cm. 4) Find the area of a rectangle if its perimeter is 30 and its base is 8. 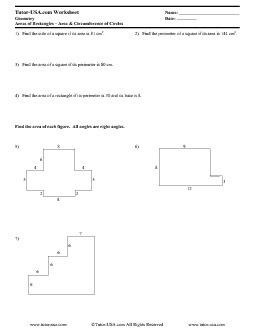 5-7) Find the area of each figure. All angles are right angles. 8-10) Find the area and circumference of the circle.